1. Transportation. Moving a product or raw material from one place to another takes time, incurs the risk of loss or damage, and does not increase the product’s inherent value. Minimizing transportation saves time and money by making the assembly, parts picking, or production process faster and more efficient. 2. Unnecessary/Excess Inventory. This can be a raw material, work in progress, or finished product that is purchased or produced but is not needed. This represents a waste of not only money but also valuable space and time, and can result from inefficient or disorganized storage systems. 3. Unnecessary/Excess Motion of a worker or equipment wastes time and energy, and can even lead to accidents and injuries in the workplace. This waste is high when static storage systems such as pallet racks and wire shelving are used. 4. 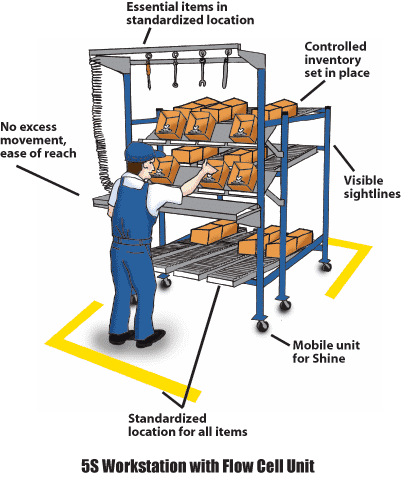 Waiting is the waste that results when a product is not being produced or transported, and represents a significant portion of a product’s shelf life. 5. Overprocessing results when more work is done on a product than is required, or when more complex or unnecessary production processes are employed. 6. Overproduction, or simply the production of more goods than required, increases all other wastes. 7. Defects that require a product to be reworked or even scrapped are a huge waste, and for many manufacturers represent a significant amount of cost. UNEX carton flow systems offer a low-cost and highly effective means to eliminate these wastes in the workplace while increasing order picking efficiencies and accuracy, improving space utilization, and decreasing labor costs. One key area in which to apply lean manufacturing is the storage mediums used for assembly and parts picking. Static storage units such as shelving, containers, pallets, and wire decking result in wasted space and poor visibility. As a result pick rates are low, and workers risk injury by searching for products and then climbing, lifting, or overreaching to get them. Dynamic storage offers a safer, more ergonomic solution for assembly and parts picking, and can increase space utilization by up to 50%. For example, a Flow Cell system minimizes reach distances by ensuring that the product is always up front and accessible, and therefore always within easy reach. Pick access and accuracy are greatly improved because parts are angled toward the picker. These factors can increase pick rates by up to 30%. In addition, full-depth storage and first in/first out stock rotation can be maintained without any interference. Each unit is configured to meed the needs of an individual operation, and its flexible modular design allows for reconfiguration as a company’s needs change or grow. A well-designed dynamic storage unit, such as Flow Cell for line side storage and Carton Flow in general storage, offer a fast and inexpensive way to implement lean manufacturing in your workplace. Contact us today for a Flow Cell quote.